In the upcoming months we will be celebrating both Mother's Day and Father's Day. While there never really needs to be a special occasion to honor the mothers and fathers in our lives–having these special days carved out specifically to honor them is always a nice thing. Zondervan recently released two special devotionals that would make such beautiful gifts for these upcoming celebrations. Every dad needs a little help sometimes! Looking for instruction, reassurance, or encouragement? 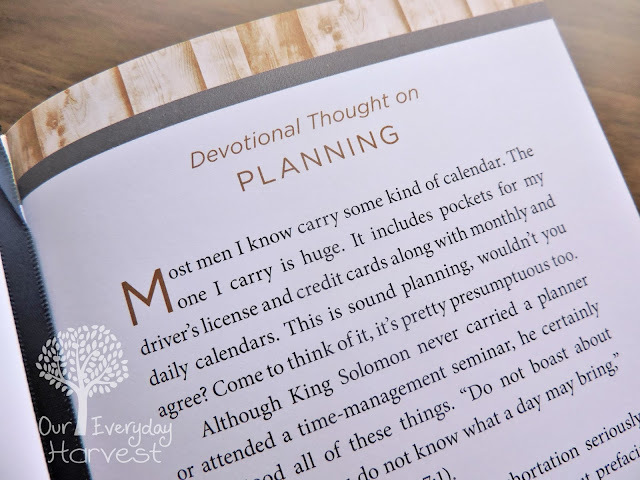 These topically arranged devotions and scriptures from the NIV Men’s Devotional Bible will inspire and guide you every step of the way. Whether you’re raising toddlers, teens, or children of any other age, God’s Words of Life for Fathers offers practical wisdom for everyday parenting. This handy reference will strengthen you in your challenging and rewarding role as a father. Regardless of what you find yourself facing as a mom, you can find peace and comfort in the eternal truths of Scripture. 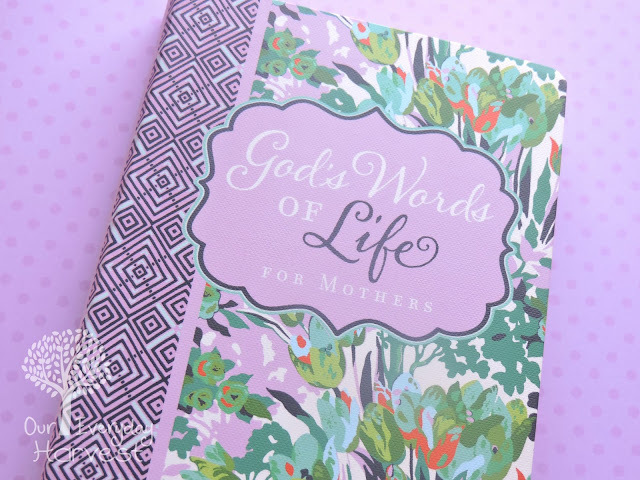 Encourage your heart and soul as you read through God’s Words of Life for Mothers, a beautiful book of curated verses to inspire you in every season. The cover features a beautiful fabric pattern from designer Amy Butler, and pages have unique scalloped edges. Whether you’re busy amid life with littles or advising your grown children through early adulthood, lean on God’s wisdom to love your family well. I had originally picked up God's Words of Life for Fathers for my husband, but when I saw how nice it was, I knew that I'd want to also see what God's Words of Life for Mothers was all about. 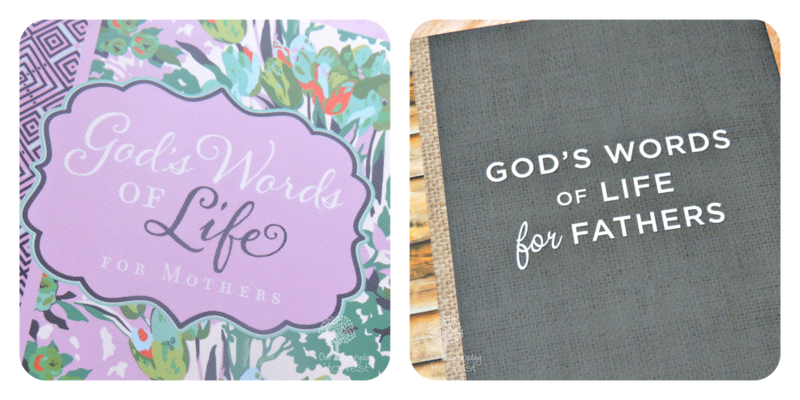 Both devotionals are lovely in their own way. Each one is small in size, which make them handy to keep any place where you can easily grab it for a quick word of encouragement or advice. 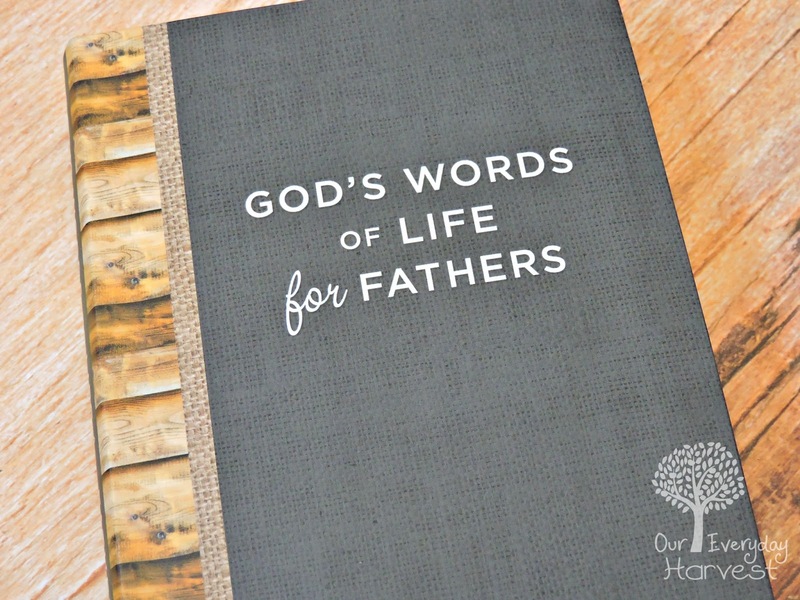 The father's edition has a very masculine design, which is perfect for a men's devotional. The exterior cover is predominately black with an almost burlap looking pattern and wood plank design near the spine. The inside includes that same wooden plank design as a border on the top and bottom portions of each page. There is also a black ribbon sewn into the book for easy place keeping. The mother's edition is definitely more feminine and quite beautiful, which is perfect for a women's devotional. The exterior cover has pretty floral illustrations with pastel pink diamond designs near the spine. Those same pink diamond designs border the interior pages, as well. 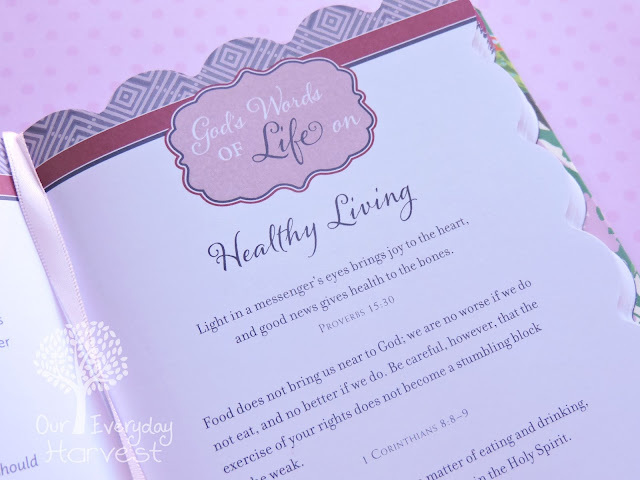 Like the father's devotional, the mother's book also has a ribbon bookmark sewn in order to keep one's place while reading–only the ribbon is pink to match the color scheme. Another design feature that is truly unique and one that I wasn't expecting to see was the scalloped edges for the interior pages. I thought this was a really nice, and definitely adds to the beauty and femininity of this mother's devotional. Both devotionals follow the same overall layout when it comes to reading. Each one touches up on everyday subjects such as communication, anger, fear, forgiveness, priorities, stress, wisdom, values, etc. There is a table of contents at beginning of each book for easy referencing, which is nice for those time when you just want to read about one particular topic. Each devotion starts off the same with a title God's Words of Life On... 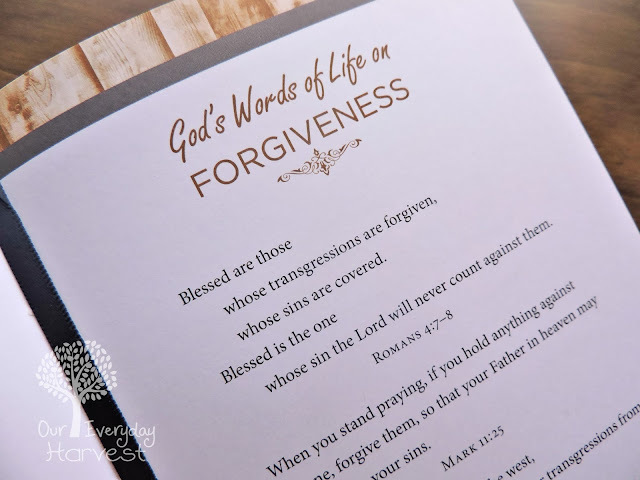 There are then two to three pages of Bible scripture verses to reflect on the subject at hand, followed by a page that includes a devotional thought to offer bits of encouragement and advice. 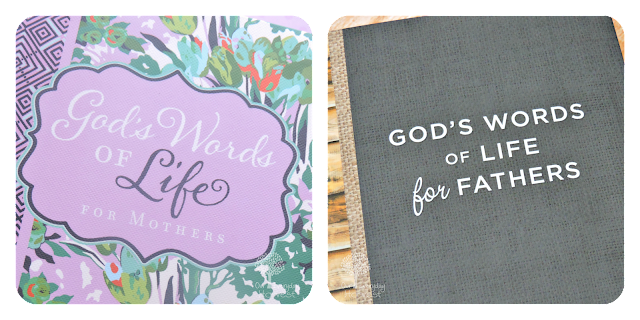 The only difference between both devotionals, besides their physical appearance, are the backs of each book. The father's devotional includes a scripture index for easy referencing, although it doesn't really offer the topic at hand in this area, only a collection of passages that can be looked up in the Bible. The mother's devotional doesn't have this scripture index, but does include about seven lined pages for personal journaling and reflection. Both God's Words of Life for Fathers and God's Words of Life for Mothers are suitable for parents with children of any age, infant to adult. They're perfect for when you need a quick moment of comfort or reassurance in a certain area of your life. The multiple pages of scriptures for each topic definitely come in handy for when you are seeking God's wisdom. 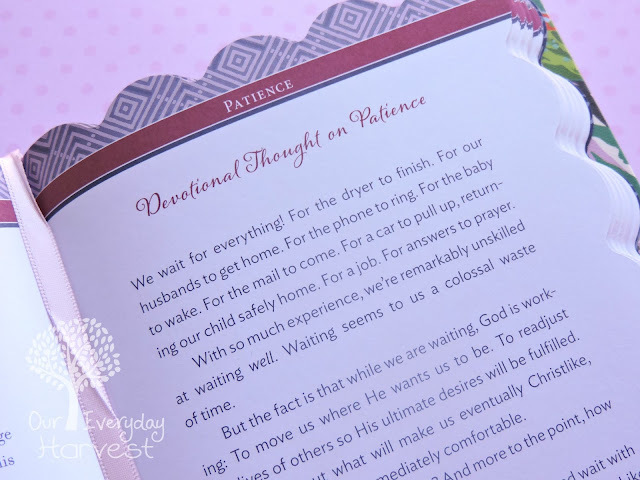 Each devotional would make a special gift to show loved ones just how much they mean to you, and more importantly just how much they mean to God. These would also be perfect for keeping at your own tableside for extra words of encouragement when you need them.